Addon One is a modern and sober active monitor speaker, which takes small loudspeakers to a whole new level with great hifi sound, a rich bass and wireless possibilities.The loudspeakers are small and claims little space next to your TV. But despite its small appearance, Addon One delivers great hifi sound with a rich bass. Connect to your TV’s headphone output and your TV’s remote will control the volume. Addon One can be connected to any product with sound output/headphones out. Connect to computer, mp3-player, mobile phone, iPod/iPhone/iPad dock, cd-player or radio. Addon One can be connected to all devices which has a line output, both 3.5mm stereo or RCA. All Addon speakers are easily connected to most sound sources. 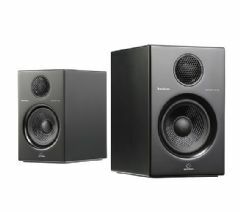 Give your computer hifi sound, let your flat TV be heard properly, or play from your iPad/iPhone/iPod-dock. Any source with a headphones output can be connected to Addon powered speakers. Options: Basestands. For elevation in nearfield listening.